Before you even begin to think about how to make the chicken margherita, you’ll want to spend a little time making a batch of keto zucchini fries. While the scrumptious fries are baking in the oven you’ll have exactly 20 minutes to prep the margherita, leaving you plenty of time to nibble on keto goodness – now that is an appetizer well done, very time efficient too! The star of the dinner should be the chicken, so don’t get carried away, try and save some fries for the dinner as well, they are wonderful little things for dipping. The goal in baking a chicken margherita is to keep the chicken breasts nice and moist. Refrain from overcooking them, bake them slow and keep them covered with plenty of juices, in this case the marinara sauce. One additional step you can take, is to pre-marinate the chicken breasts in a brine made of water, salt, coconut aminos and olive oil for about 15 minutes before baking. Soaking them for 30 minutes is the ideal time to end up with a super moist chicken breast. But if time is limited, follow the recipe as is and all of your expectations will be fulfilled. You may want to serve this chicken margherita with a keto celery and olive salad, keeping the ingredients in line with the origin of the recipe. Bonus points for it being a raw salad, with no additional cooking time required. In a bowl combine the oregano, paprika, garlic, sea salt and ground black pepper. Season the chicken breasts with the oregano mixture, making sure they are well coated. 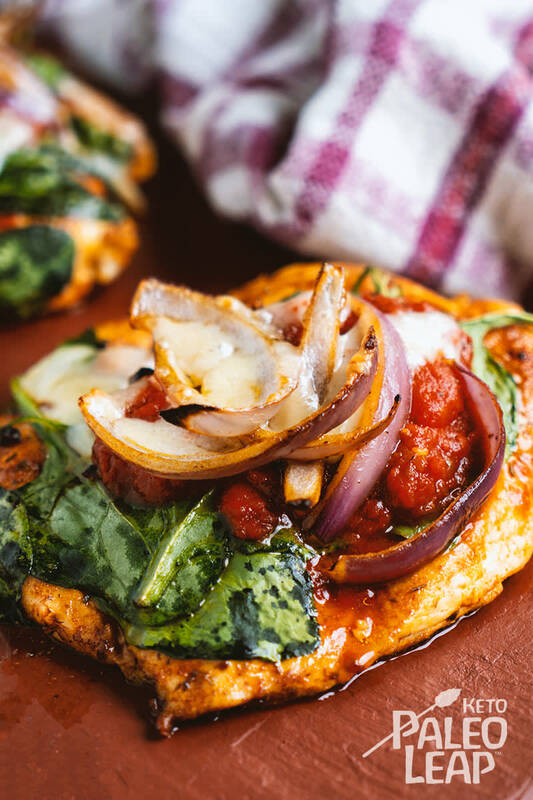 Place chicken in a baking dish and top with onion, spinach leaves, marinara sauce, basil and Parmesan. Place in oven and bake 15 to 20 minutes, or until chicken is cooked through. Serve topped with additional fresh basil.